William "Flint" Carter was a seasoned prospector who had dozens of mining claims in the Santa Catalina Mountains north of Tucson, Arizona. After forty years, Flint knew all about the mountains, its legends (like the Iron Door Mine), and its precious minerals (like Cody Stone). A funeral service for Flint will be held on Saturday, April 27(instead of pril 13) at Adair Funeral Home, 8090 N. Northern Avenue (north of Magee) at 8:00am. A military burial will follow at the Verteran's Memorial Cemetary in Marana. Call 623-3733 for more information. Before his death, Flint was able to compile his experiences and knowledge about the Santa Catalina Mountains in The Canyon of Gold, Buffalo Bill Cody, and the Legendary Iron Door Mine Treasure. He also collaborated with author Robert Zucker with "Treasures of the Santa Catalina Mountains." Both books are available on Amazon.com. For more information, contact [email protected]. In honor of Flint, the 4th Annual Cody Days in Oracle was still held on Saturday, February 23 and Sunday, February 24, 2019. Read more about Cody Days in Oracle. The community of Oracle honors the 173rd birthday of iconic world entertainer and local miner William “Buffalo Bill” Cody, and pays tribute to the recent passing of Flint Carter, during the 4th Annual Buffalo Bill Cody Day in Oracle, AZ, on Saturday, February 23 & 24 from 1:00-5:00pm at the Oracle Inn in Oracle, Arizona. Native American displays, live entertainment, and more! Read more about Cody Days in Oracle. Local History Collector's: In one collection of six items that tell the story behind the gold and silver from Buffalo Bill Cody's mines in the Santa Catalina Mountains. Historical information and evidence of the legendary Iron Door Mine. 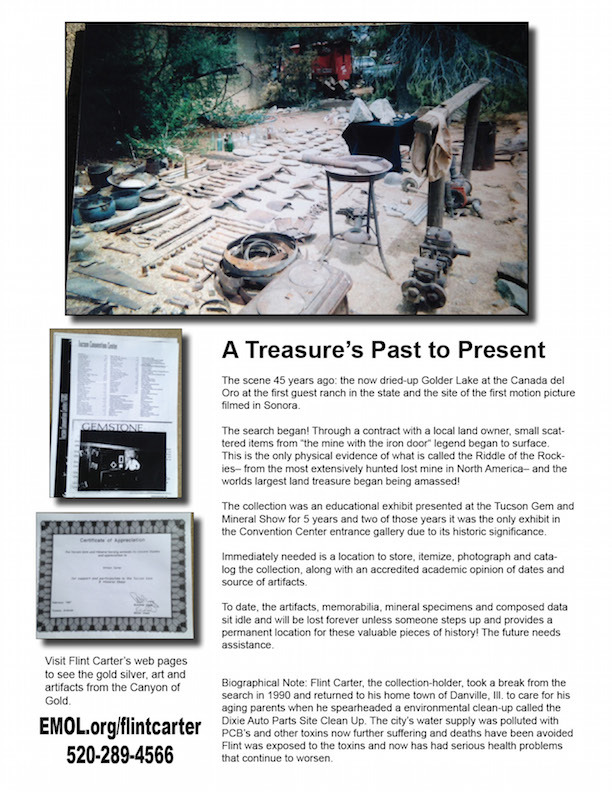 This 6-piece package includes: two books "Treasures of the Santa Catalina Mountains," and The Canyon of Gold, Buffalo Bill Cody, and the Legendary Iron Door Mine Treasure," a movie CD "Buffalo Bill," two CD of the Miner's Story with interviews of Flint Carter, and an audio CD of music of the Santa Catalina mountains by Gary Holdcroft. Price: $100, or individually sold. Photo above left to right: Small stone on loan to University of Arizona 5 years- graded 38 out of 40. This is one of the finest 100 percent natural gold and silver specimens in the world, $3,926. Middle item: The "horse," $50,000. Right: large 23 lb specimen, $250,000. Flint Carter was featured in the March 2015 edition of "Outside Magazine," has appeared in numerous videos on the legends and lost treasures of the Old West, and recently featured in a new book on the legends and history of the Santa Catalinas. See samples of Flint Carter's Cody Stone directly from the mines of Buffalo Bill Cody in the Santa Catalina Mountains. Before Flint's passing, he wrote: "A friend set up a Go Fund Me account because of a severe health situation." Flint does not want charity! To sell some of the collections will not cover costs– already over $100,000– with no medical help. Visit Go Fund Me for Flint. Our signature sterling book marker - with or without the stone that started the legendary literary and film adventure over a century old and a multi million dollar story ! 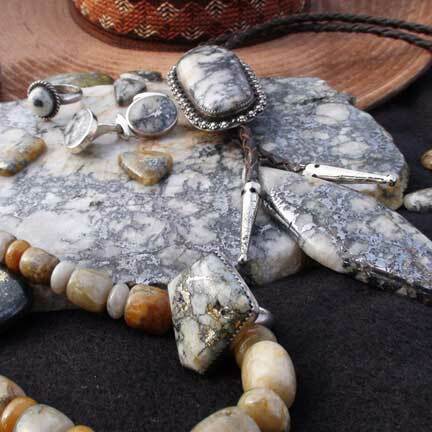 Flint Carter also mines rare jewelry-grade gold and silver in quartz minerals exclusively from the Catalina Mountains called "Cody Stone," named after the famous world-wide entertainer "Buffalo Bill" Cody who owned a gold mine in the Santa Catalinas called Campo Bonito. "Treasures of the Santa Catalina Mountains. Flint Carter has released a new book called "The Canyon of Gold: Buffalo Bill & the Legendary Iroon Door Mine Treasure." In his book, Carter describes his version of the legend that has intrigued treasure hunters for centuries. This new book on the legends and history of the Santa Catalina Mountains, collaborated with Flint Carter, is now available. Read free chapters of "Treasures of the Santa Catalina Mountains." Purchase online for a discount at amazon.com (Treasures) or locally in Tucson at Mostly Books, Summit Hut, Oracle Inn and other locations. Read about the Treasures of the Santa Catalinas in the new edition of Tucson Chronicles. Discover the history and legends of the Old West with historian Flint Carter. Watch a video of slides from the new book "Treasures of the Santa Catalina Mountains" with original music about the Catalinas written and sung by Gary Holdcroft. "Esmeralda," from an album of songs written and performed by Gary Holdcroft. An original ballad about the legendary Mine with the Iron Door in the Santa Catalina Mountains, north of Tucson, Arizona. Esmeralda is the name of one of the lost mines. The Escalante Mine is another lost mine legend. Watch Flint Carter speak on the Santa Catalina Mountains on KGUN-TV "Morning Blend"
The Lost City in the Santa Catalinas. Lecture by Flint Carter June 12, 2010. See more Videos of Flint Carter. Flint Carter has lived and mined the Santa Catalina Mountains for over forty years. His stories and experience has been preserved through these pages and his involvement with a book on the Catalinas. Explore the legends with Flint Carter. Buffalo Bill's Arizona Mining Ventures William F. Cody (1846-1917) better known as the Wild West Show entertainer “Buffalo Bill,” had invested in many mining interests. One mine was near the town of Oracle, 40 miles north of Tucson, Arizona a decade before the Arizona territory entered Statehood. Read about Buffalo Bill Cody's time in Arizona. Legends of the Old West. 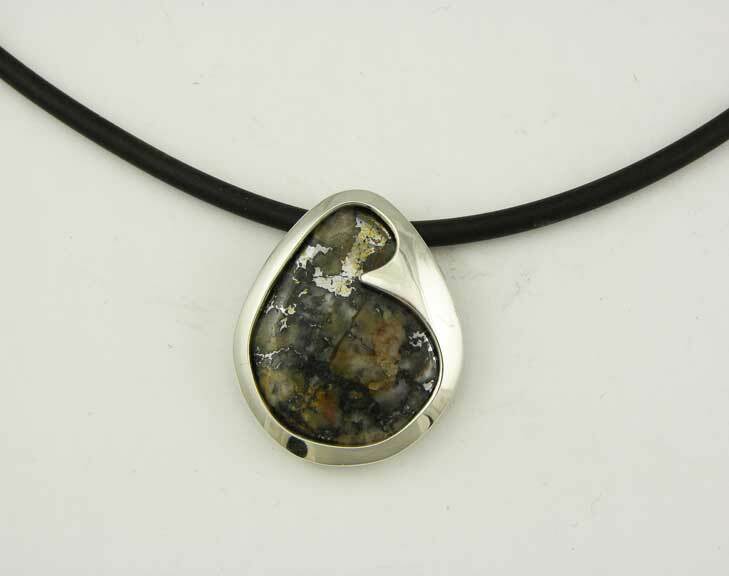 Southwestern Jewelry Grade Flint has the only source of jewelry-grade of gold and silver in quartz from Mt. Lemmon. This precious stone has "la vie dasante" ("life's dancing light"). 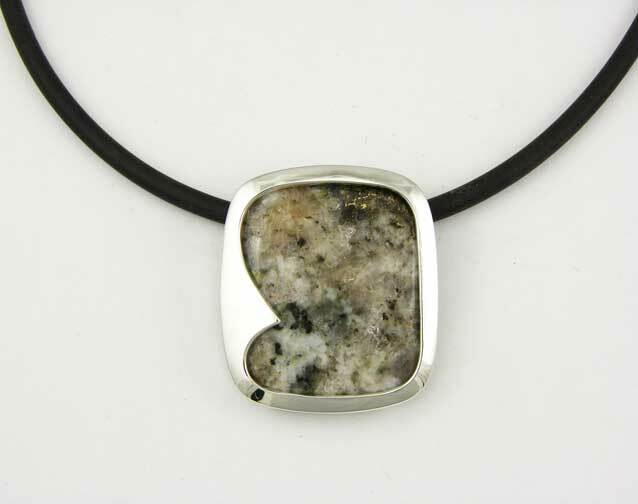 CodyStone Jewelry and Celebrity stones are made from local ore from Southern Arizona, USA and designed as jewelry grade gold and silver in quartz. "Flint Art" is a collection of hand painted Southwest art, cards, paintings and sculptures exclusively created by Flint Carter. Legend of the Iron Door Mine article in The Explorer. November 25, 2009 Saddlebrook special edition. Read about Flint Carter and the history and story surrounding the Iron Door Mine legend and legends of the Old West. Outside Magazine: Flint Carter is profiled in an 8-page spread in the March 2015 edition of Outside Magazine. The article covers his recent expedition deep into the Catalinas with the writer from Outside Magazine and his crew. Follow Flint's mining expedition. Located at the entrance of the Oracle Ridge Mine in the Santa Catalina Mountains north of Tucson, Arizona, on a small bluff is a huge, ancient monolith with unusual markings. See photos and read about the Oracle Ridge Monolith. The Iron Door Mine is one of "the most extensively hunted lost mine in North America." There appears to be some evidence about the treasures of the Old Southwest in an area known as Canada del Oro, "the Canyon of Gold." Located deep in the mountains north of Tucson, Arizona, near Oracle, AZ., may lie the legendary Iron Door Mine and valuable gold and silver treasures, according to Arizona historian Flint Carter. Popularized by Harold Bell Wright's 1923 novel "The Mine With The Iron Door," this treasure may still be buried somewhere in the desolate and inaccessible Cañada del Oro, the Canyon of Gold. 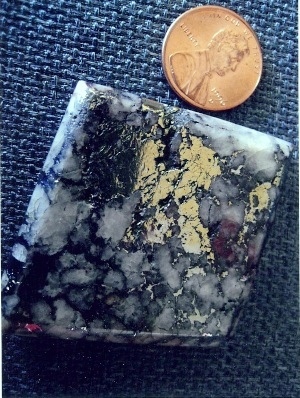 The lost mine legend also appears to have a connection with the 100 tons of gold treasure discovered at Victoria Peak in New Mexico. Photo: This 23 lb. nugget is the finest specimen from Buffalo Bill Cody's mine near Oracle, Arizona. 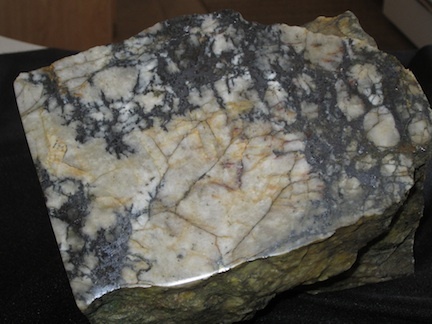 From established sales this rock is valued over $1/4 million. Flint's efforts are on display in ten museums and the Mining Hall of Fame. For decades, Carter has been the owner of the richest gold and silver mines on the Santa Catalina Mountains near Tucson, Arizona. It has been almost 40 years now, and the body of work he offers is huge to say the least. It covers hundreds of years of history puts the gold and silver of the legends in your hands as a testament to our mountains' beauty and incredible wealth. Flint Carter describes the history and stories of the Southwest, Iron Door Mine, mining for gold and other ores around Tucson and Southern AZ. and many other historical topics and legends. Carter showcases his art, jewelry and artifacts in public and private presentations. 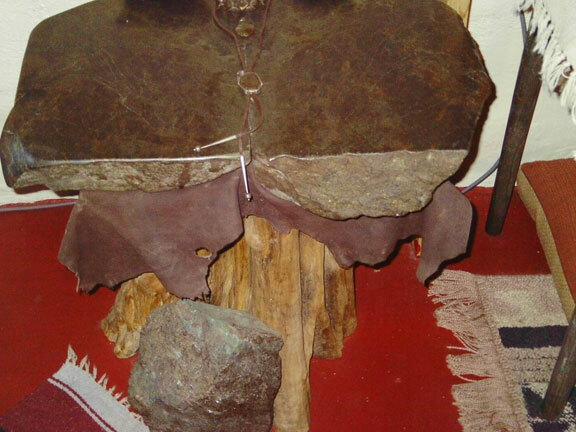 Flint's private collection is on display at the Oracle Inn in Oracle, Arizona. Photo: Tucson's Cody Stone Jewelry manufactured by Orlando Jewelers of England.The Iron Door Mine. First popularized by Tiffany's during the California Gold Rush, Cody Stone is a little known- and now extremely rare- commodity. It is the most expensive gold and silver in the world that sells by carat weight values. 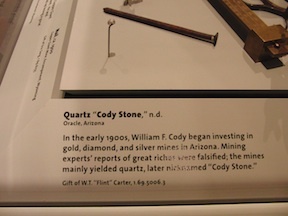 Cody Stone is on display in museums worldwide and the Mining Hall of Fame and Gem Institute of America. The specimen, on loan to the University of Arizona MIneral Museum, was independently graded at 38 out of 40 and is considered one of the finest 100% natural gold and silver specimens in the world. The result of a search for the West's largest gold legend and the world's largest land treasure portrayed in four major motion pictures over six decades, this golden legend refuses to die and continues to grow with substantial golden values. "Gold still glitters in the ground, hiding secret like a laughing clown." - from "Gold Town" by Joseph Michael Darwin. Left: "Prospector" original art work by Flint Carter. 5" x 7" original. See more Flint original art. The Miners’ Story Project preserves and shares stories about life in the mines and mining communities in the Southwest US. William "Flint" Carter provides his recollections of the history and stories of the Santa Catalina Mountains. Read more about the Miner's Story Project. The Miner's Story CD is a two and a half hour recording of the mine with the iron door by Flint Carter. $19.95. 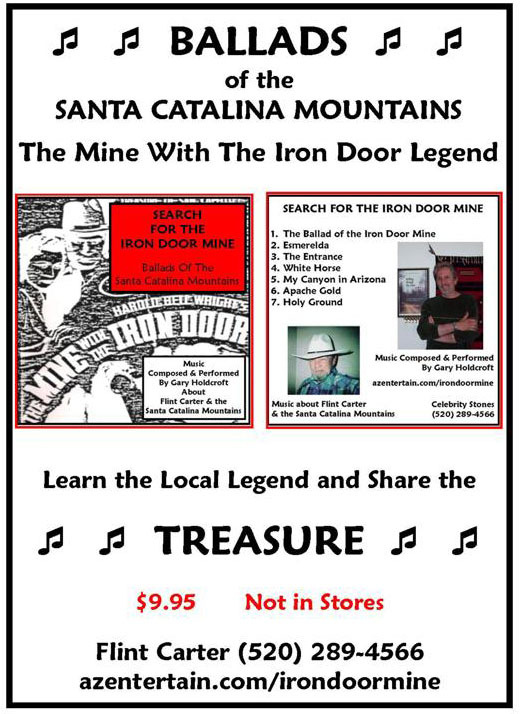 The original songs and ballads about the Iron Door Mine, the Santa Catalina Mountains, the Old West and about Flint Carter on CD. $9.95. These songs were written and professionaly performed in a studio by Gary Holdcroft specifically about Flint's adventures and the legends of the Catalinas. A large collection of the legends and history of the Catalinas. Learn the story of the Iron Door Mine, the Lost Mission and the Lost City. Hundreds of pages cover hundreds of years in the search for gold, silver and copper. Was there a Lost Escalante Mine or Mine wth the Iron Door? Who started the legends? Is there still gold in the mountains? Explore the Santa Catalina Mountains in a way you never seen them before. Read free chapter samples of "Treasures of the Santa Catalina Mountains." All of these pieces are from Flint Carter's Mine. Read about collecting rare stones from Mt. Lemmon. 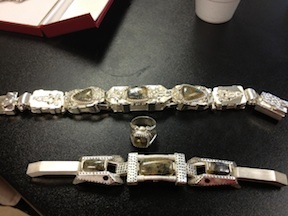 Cody stone jewelry available for public sale. New design of Codystones prepared for sale. Contributing jewelers are Gary Holdcroft, Isaac Hunan, Bisbee Bob, Poncho, Buzz Stringer, Steve Montez, Michael Garcia, AAA Family Jewelers in Tustin, CA; the Navajo nation; Will Dentondale, a Navajo artist; Orlando Jewelers UK, James Svoboda, Cornelious Hollander and William F. Carter. Cody Stone from Mt. Lemmon Arizona is gold and silver in quartz. Review specimens for sale at the only accredited site to purchase Cody Stone. Specimen of Cody Stone is on display at the University of Arizona Mineral Museum's "100 Years of Arizona's Best- the Minerals That Made the State" exhibit. 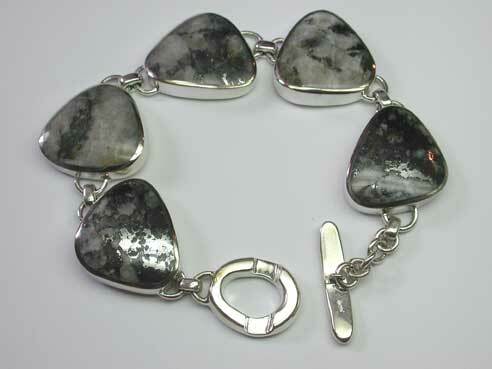 Exquisite Cody Stone jewelry designed and handcrafted by award-winning Native American artist Michael Garcia. This huge speciment weighs 150 pounds and stands on a Saguaro base. This is available for sale at $150,000. This finished product was created by AAA Family Gems, in Tustin, CA., who did a phenomenal job. 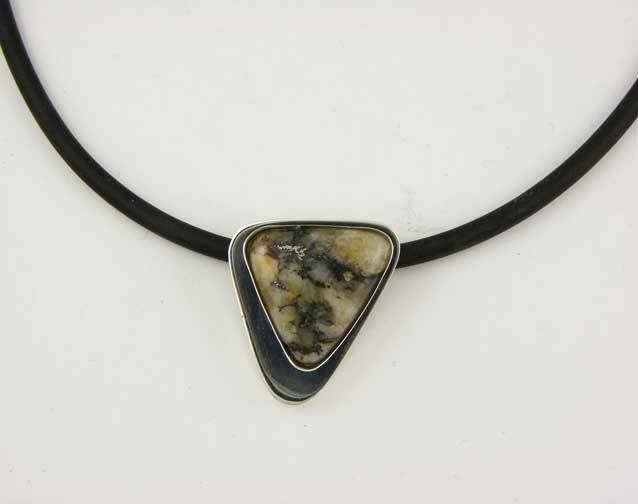 See more sample jewelry from Flint Carter. 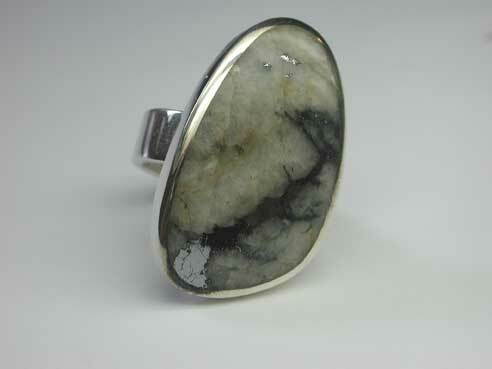 This is a cut and polished cab with gold and silver streaks of CodyStone. Celebrity Stones is proud to unveil the latest creations of Codystone by award winning jeweler Cornelis Hollander (above and below photos). 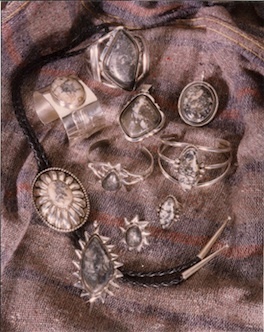 The very first cast mountings continental and seductively cradeling the 100% natural gold and silver ores from Buffalo Bill's lost mines near Tucson, Arizona. To date, jewelers list Gary Holdcroft, Bisbee Bob, Poncho, Buzz Stringer, Michael Garcia, Steve Montez, Alan Childves, Wm Carter, and now Cornelis Hollander! Kudos to the artist! Bufallo Bill would be proud! $350 each- one of a kind silver and a rubber cord. Call Flint at 520-289-4566. Read about Buffalo Bill Cody and Oracle, Arizona, by Flint Carter, in "American Cowboy" April 2013 edition. Quartz "Cody Stone," Oracle, Arizona on display at the Buffalo Bill Historical Center in Cody, Wyoming. "In the early 1900's, William F. Cody began investing in gold, diamond, and silver mines in Arizona. Mining experts reports of great riches were falsified, the mines mainly yielded quartz, later named "Cody Stone." Gift of W.T. "Flint" Carter. 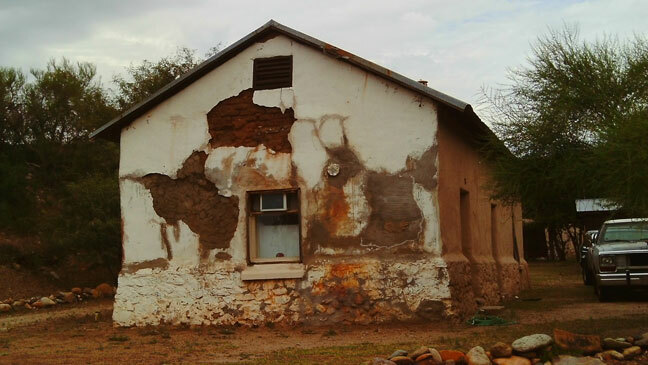 Help create a museum and cultural center to preserve Catalina Mtn. history . A lost Spanish mission is being restored by Flint Carter to preserve its great Western heritage. The building also houses his collection of stones, jewelry, art and artifacts recovered from around the property in the Santa Catalina Mountains. See more about The Santa Catalina Historic Preservation Project. While Flint Carter, SCHPP director, is doing the work on his own time and money, tax deductible donations through SAI, Inc. are accepted to help toward its restoration and preservation. The "Hooked X" Templar sign on stone found in the Cañada del Oro, near Tucson, Artizona. What legendary treasure mystery hides beneath the flooded old tunnel sides? Buffalo Bill's tent cabin in the Catalinas, now now burnt by campers. (Above) Oliver Stratton's old homestead that sits above the old mine, now the Oracle Ridge mine near the Monolith. Photos courtesy of Flint Carter. © 2001-2019 EMOL.org. Entertainment Magazine. All rights reserved.